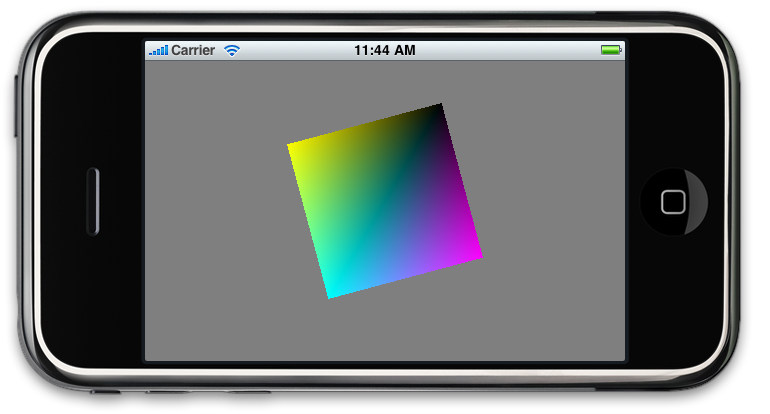 For a project that I’ve been working on, I’ve been using OpenGL ES on the iPhone to do 2D in widescreen. Since I struggled a bit to get it setup, I’ll go ahead and share how I got things going. First up, you need a project to work in — I’m using the OpenGL ES Application template in XCode for this. Also, I’m using the 3.0 SDK. This should apply just the same to earlier SDK versions, but there may be minor differences. Out of the box, this project will use an orthogonal view. But it isn’t in widescreen mode, and the 0,0 is in the center of the screen. This might be fine for some uses, but if you are porting code that expects 0,0 to be someplace else, this just isn’t going to work. For this example, we are going to setup the scene so that 0,0 is the bottom left and 480,320 is the top right. What we are doing here is setting up our two matrices — the projection matrix and the model/view matrix. We rotate the matrix -90 degrees so that we will be in widescreen mode with the home button on the right. If you want to flip it the other way, just rotate +90 degrees instead. Once we’ve done that, we can setup our orthogonal projection with the bottom left being 0,0 and the top right being 480,320. For the model/view matrix, all we need to do is just translate the matrix so that the bottom left is 0,0 and the top right is 480,320. You can add a new entry by clicking on the + button that shows up when you click on any line. It doesn’t matter where in the file the flag is — you can put it anywhere. I hope at this point you have enough to get started with 2D projection in widescreen on the iPhone. Please let me know in the comments below any questions you may have, and I’ll try to answer them. Maybe if there is enough interest, I can do a follow up article as well.